Another confused performance from United brought a 0-0 draw against Burnley. United had plenty of possession and, with the likes of Juan Mata, Robin van Persie, Wayne Rooney and new signing Ángel Di María on the pitch, should have posed a better goalscoring threat. 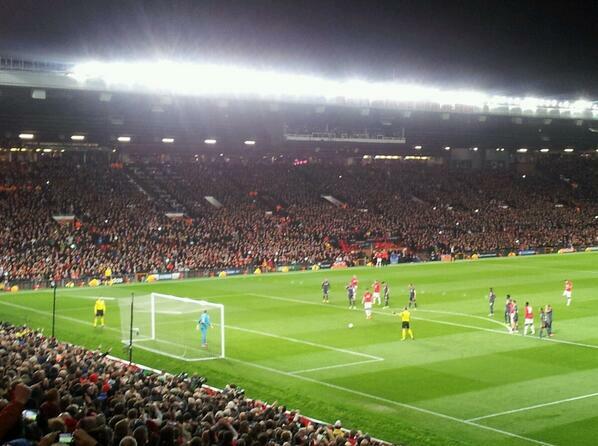 Old Trafford wasn’t overcome with confidence pre match tonight. Sure we all knew that United could and should beat Olympiakos, but after the first leg and the shambles on Sunday, it was a cautious crowd walking down Warwick Road. The crowd were frenzied early in the game. The noisy contingent of Greeks in the upper tier of the Scoreboard End were drowned out by the fervour of United fans. This isn’t always the case for home matches in Europe but a comprehensive defeat in Piraeus three weeks ago had rallied the Old Trafford crowd in the hope of rallying the team. United made a terrible start to the 1986-1987 season, apparently still in a state of depressed inertia after blowing a ten point lead the previous season. The reds didn’t win ’til the 13th of September, beating Southampton 5-1 but United were only out of the relegation zone on goal difference. The discontent on the terraces towards Ron Atkinson was now coming to the fore. Ron Atkinson never had the hearts and minds at Old Trafford with the fans the way Sir Matt Busby or Tommy Docherty possesed, despite being very popular with the media. The United team were suddenly looking old and tired, players who should have never have pulled on the red shirt, like Graeme Hogg, Colin Gibson & Johnny Sivebaek were getting regular games. The main problem with the midfield of Bryan Robson, Norman Whiteside and Paul McGrath was trying to keep them out of the pub. Up front, we had a forward line of an ageing Frank Stapleton, the incredible Terry Gibson, a man who was signed from Coventry in exchange for Alan Brazil, he had the physical build of Diego Maradona and the footballing skill of Madonna and the hard working but not good enough signing from Nottingham Forest, Peter Davenport. United were drawn against Southampton for the 3rd round of the League Cup and six weeks after beating them 5-1 at Old Trafford, drew 0-0 meaning a replay at the Dell. Just over a week later, Southampton beat United 4-1 to knock United out of the league cup in what was Atkinsons’ last match as United manager. We’ve since learned that Bobby Charlton sounded Alex Ferguson out about the United managers job at 1986 World Cup in Mexico whilst he was there as Scotlands’ caretaker manager. Alex Ferguson who’d nearly become Tottenham Hotspur manager when Keith Burkenshaw resigned in 1985, had been a phonemenal success in Scotland as Aberdeen manager and he had a clause in his Aberdeen contract that if Manchester United expressed an interest in him, he could talk to them. The talks which ended up in Ferguson becoming United manager were conducted in such a clandestine way as to bless a novel by Ian Fleming. On the 5th of November 1986, Ron Atkinson was dismissed as Uniteds’ manager, he walked away with a dignity which Tommy Docherty would’ve done well to witness and emulate. The following day, Alex Ferguson was announced as Uniteds’ new manager. He had two days to prepare for his first match against Oxford United at the Manor Ground. United lost 2-0 to Oxford, Ferguson claimed later that the enormity of what he’d taken on became apparent that day. Following a goalless draw at Carrow Road, United won for the first time under Alex Ferguson when Johnny Sivabeck scored against Queens Park Rangers in a 1-0 win two weeks after he took over the reigns. Following a 1-0 defeat to newly promoted Wimbledon and two consecutive 3-3 draws against Spurs and Aston Villa, United went to Anfield to play the previous seasons double winners, Liverpool. If there was one game United didn’t need at this moment it was to be playing away to a Liverpool team whom in my opinion, at that time, would’ve given any team in the world a good game. As per usual in this fixture during the 1980s, Norman Whiteside upset the scousers and the form book whilst delighting the bookmakers to give United an unexpected win and as an added bonus, incur the wrath of the legendary John Peel on Radio 1. United only won one away league game all season, it would be typical that of all the places to get that win, it would be Anfield where it happened. Everything that symbolised United during that era occurred the following day when United lost at home to a Norwich City who in those days, were no mugs, but they shouldn’t have been beating United at Old Trafford. In early February and in a game where Terry Gibson scored his only goal for the reds, United won 2-0 against a title challenging Arsenal side who’d been taken over by George Graham the previous summer. This was the first sign of the steel Ferguson had instilled in the United side. Norman Whiteside wound up Arsenal midfielder Paul Davis and full back Viv Anderson to a frenzy and alongside Bryan Robson, ran the midfield imperiously. It wouldn’t be the last time during Fergusons reign that a match involving United and Arsenal became heated. Ferguson steadied the United side for the rest of the season to achieve mid table safety by March. On Easter Monday, with a last minute goal from Peter Davenport, United completed their first league double over Liverpool since 1969/1970.